In this review, we explore in more details the features of the Suunto D6i Novo that advanced recreational, technical and professional divers are looking for. Suunto discontinued the D6i in January 2017. This left the D6i Novo as their leading watch sized dive computer. Not long before discontinuing the D6i, Suunto released the D6i Novo Zulu. This has become a very popular choice for free divers and spear fishers. If you already know the Suunto D6I Zulu is for you, click the button below to see the latest pricing and any savings that apply at your local Amazon store. Click on the item below to find the answer to your most pressing question or keep scrolling to read the entire review. Personalize the Functions and Settings - Make it your own! What's the expected Battery Life and replacement? 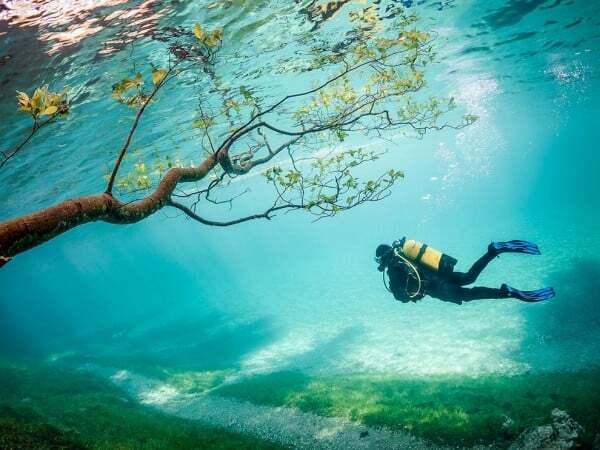 Thinking of diving at different Altitudes? What about the wireless Air Transmitter (AI)? Buy Suunto D6i Novo Zulu or retrofit to other D6i Novo models? What about the Suunto Manufacturer's Warranty? Looking for Bargains on the Suunto D6i? All Suunto D6i Novo dive watches feature a tough steel case and scratch-resistant sapphire crystal glass, with a protective coating that shields against dirt and grease. It also has an anti-reflective coating. The D6i Novo is water resistant to 492 feet (150 meters), although it’s maximum operating depth is 393 feet (120 meters). The USB cable is included. 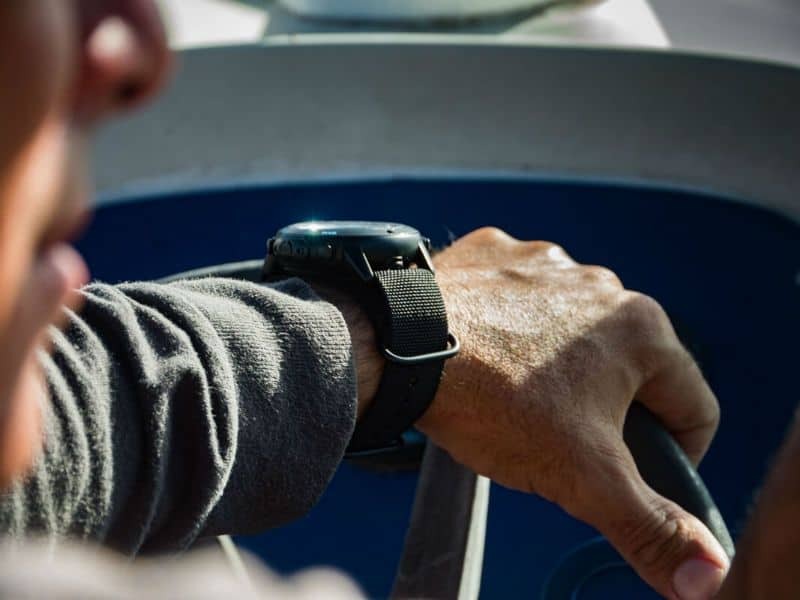 This allows you to update the firmware each time Suunto release an update, and to download your dive logs onto either a PC or Mac. 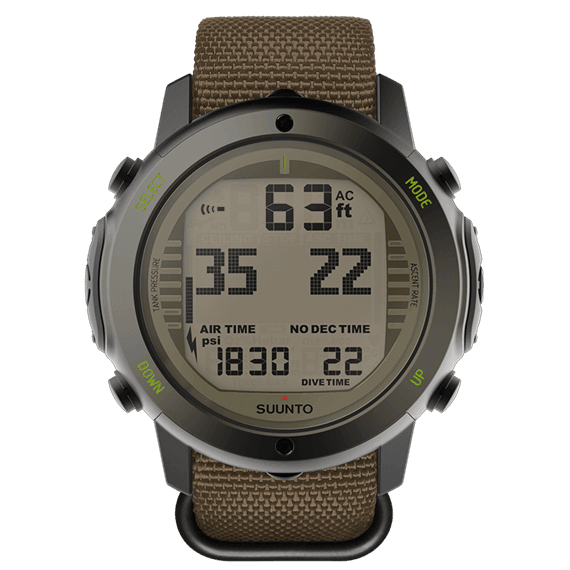 The Suunto D6i Novo measures 1.91 inches (48.5 mm) across the face and is just over half an inch thick (.63 inches / 15.9 mm). It weighs just under 3.98 oz (113 grams). The D6i Novo dive computers are easy to sync with Suunto DM5 software and Suunto Movescount so you can share your dive logs, images, and videos. 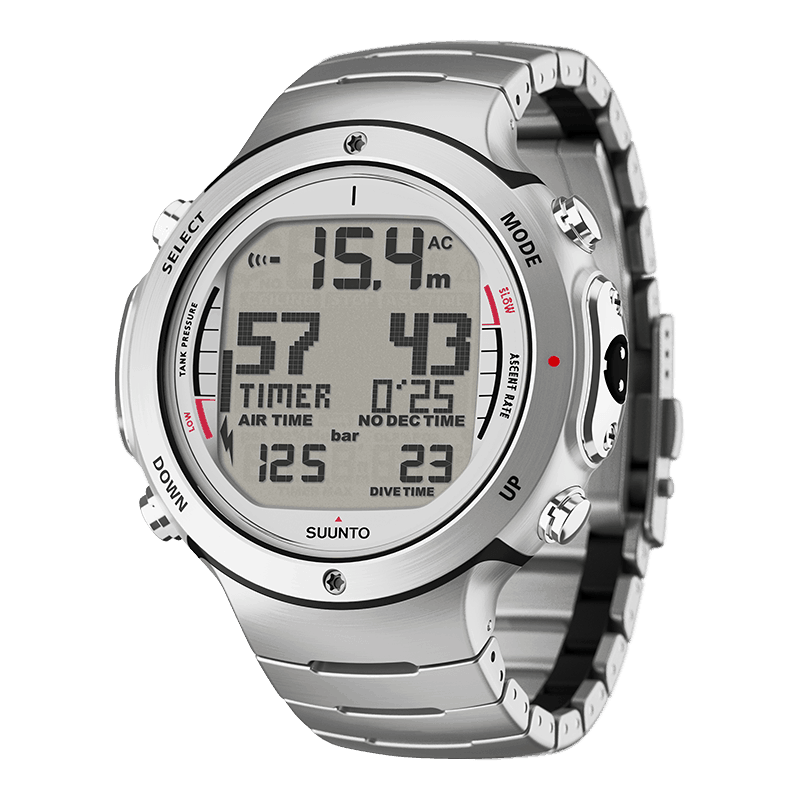 The Suunto D6i Novo is available in Steel, Black, White, Stone and Stealth. These are currently retailing between $1000 to $1200. Be careful when buying these as a package with the wireless air transmitter. The transmitter retails for around $450. Make sure the 'package' is a real deal, otherwise buy these items separately. The Zulu strap transforms the D6i Novo into a great looking watch sized dive computer. These military style straps are extremely durable and come in black, stealth (brown) and blue. These are priced slightly above the standard D6i Novo, but you'll be able to buy the D6i Novo Zulu online for under $1300. There are plenty of settings that can be adjusted to your preference. The Calendar Clock displays the date, day of the week, hours, minutes and seconds. There is 1 daily alarm clock. This can be set as a one off, or set to activate once on weekdays, or once per day. The time format can be switched to show as either 12-hour or 24 hour. It's easy to set the units to be shown in either metric or imperial units. This will be either meters and Celsius, or feet and Fahrenheit. You can't mix the two. For example, you can't have it display in meters and Fahrenheit. 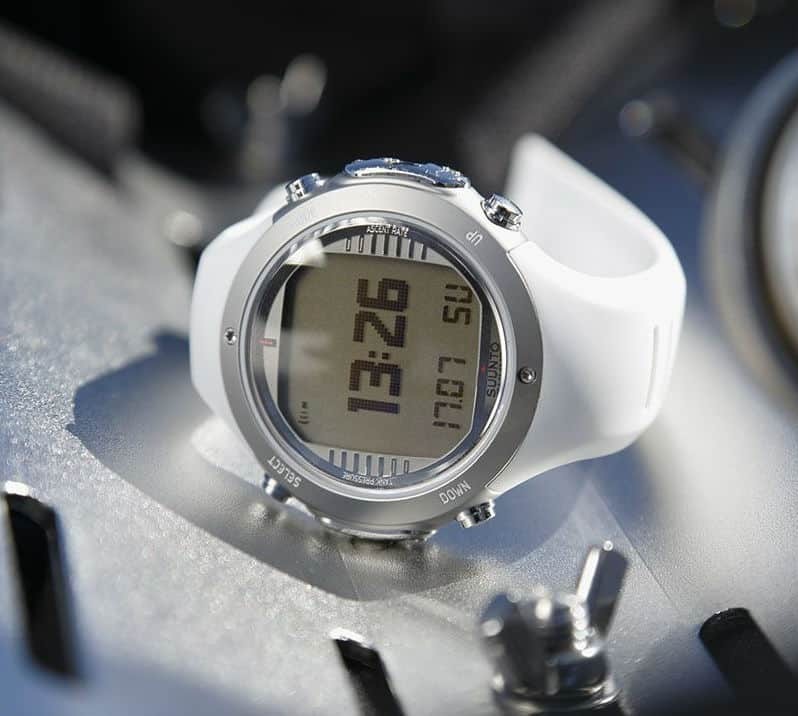 The Suunto D6i Novo includes a Stopwatch, and has a Dual Time function. This helps you keep track of the time in a second time zone. The brightness of the display can be adjusted to your own personal preference, and also to suit different diving conditions. The battery on the Suunto D6i is not user replaceable. This needs to be done by an authorized service agent. This avoids possible leakage of water into the battery compartment or the computer. The warranty becomes void if this is not done by an authorized agent. All history and logbook data, altitude, personal and alarm settings will remain in the memory after the battery replacement, but other settings will revert to factory defaults. The Suunto D6i Novo has 5 dive modes: Air, Nitrox, Gauge, Free and Off. It has the capacity to switch between up to three gases during a dive. Decompression calculations are based on the gas that's been tagged as your Primary gas. When using the dive computer in Gauge Mode, it won't calculate your dive profile. It's a depth gauge and bottom timer only. After using it in Gauge mode, you will be locked out of DIVE mode until the No Fly time is over. The No Fly time after diving in Gauge mode is 48 hours. This watch sized dive computer is very popular with free divers and spear fishermen. It can be used for free diving with its FREE mode. The Dive time is shown in the center of the display in minutes and seconds. It starts at 4 feet (1.2 meters) and finishes when your depth is less than 3 feet (0.9 meters). The maximum operating depth is 393 feet (120 meters). Up to 5 depth notifications can be set for free diving. Each notification can be turned off and has a defined depth. The low priority audible alarm sounds, and the backlight blinks when the notification depth is reached. The surface countdown timer is there to help to prepare you for your next dive. The countdown activates automatically at 4 feet (1.2 meters). 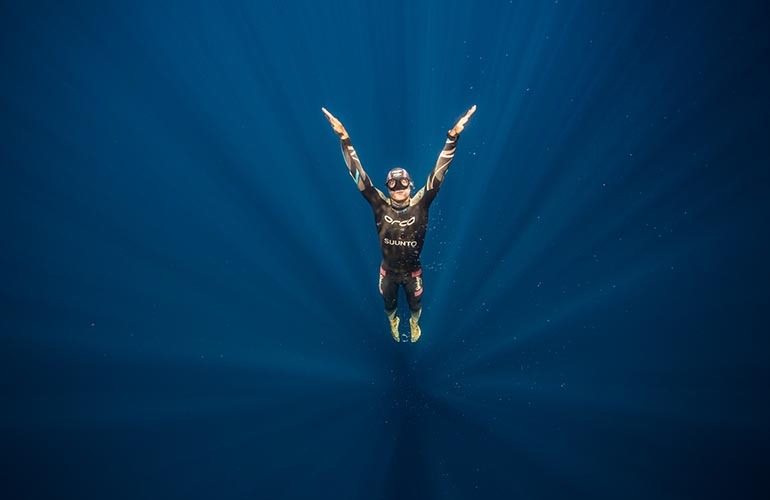 The apnea timer can be used for interval training when free diving. Adjustable settings include the Ventilation time, the Increment time (the time added to the ventilation time for each interval) and the number of interval repeats. Depending on the ventilation times and increment times, the apnea timer supports up to 20 intervals. The Suunto D6i Novo has an integrated digital compass with a tilt-tolerance of up to 45⁰ to help with navigating underwater. This will give accurate readings even when the compass isn't fully horizontal. The compass is activated from either the TIME or DIVE mode and displays your current bearing and depth. The Compass Timeout lets you adjust the length of time the compass shows for after being activated. There’s a Bearing Lock setting to help you keep you headed towards your intended direction. If your bearing starts to shift outside of your intended direction, left or right arrows are displayed that will direct you back to the correct bearing. You need to calibrate the compass the first time you use it. This is done by slowly rotating the dive computer in your hand using large figure-8 movements. The compass adjusts itself to the surrounding magnetic field and will need to be re-calibrated when traveling overseas. Below is a video showing how easy it is to calibrate the compass and set your bearing on Suunto's D6i. The Suunto D6i has an Altitude setting for diving at different altitudes. The dive computer can be manually adjusted to up to 9800 feet (3000 meters). Travelling to different altitudes can temporarily cause changes to the equilibrium of your body. The pressure in the atmosphere is different at higher and lower altitudes. It doesn't matter if you're travelling higher or lower - if you're switching your altitude by 1000 feet (300 meters) or more, you'll need to give your body time to adjust. It's generally recommended you wait at least 3 hours when travelling to a different altitude before diving. 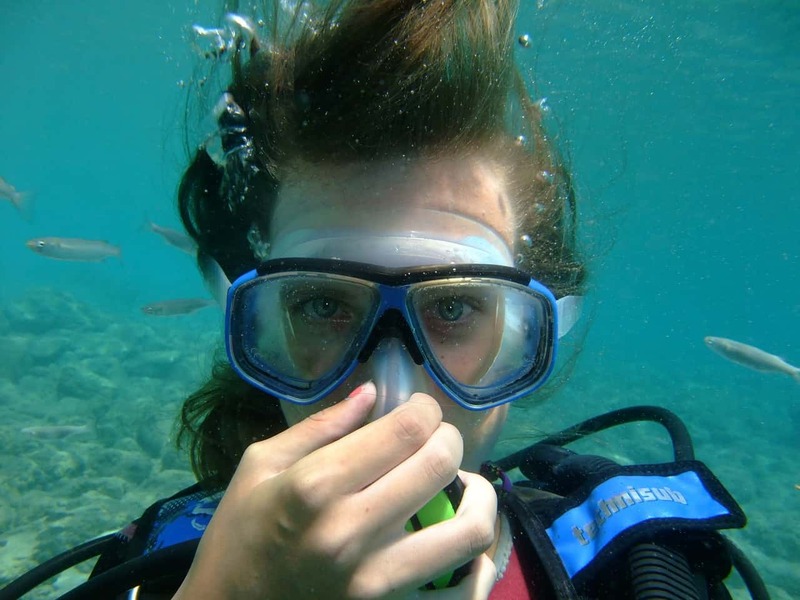 It's critical that Altitude settings are adjusted whenever you dive at altitudes greater than 1000 feet (300 meters). This needs to be included in dive planning calculations. No-decompression limits are considerably reduced due to the altitude. Air Integration (AI) technology has become more reliable in recent years. Especially when compared to the early days of wireless air transmitters. Can you dive without it? Yes. Will it make your dives easier, more accurate, safer, and more enjoyable? Yes. When you're penetrating a long and narrow passage in a wreck, you'll appreciate that your computer has AI. With the flick of the wrist, you'll see all the vital info you need with minimal movement. 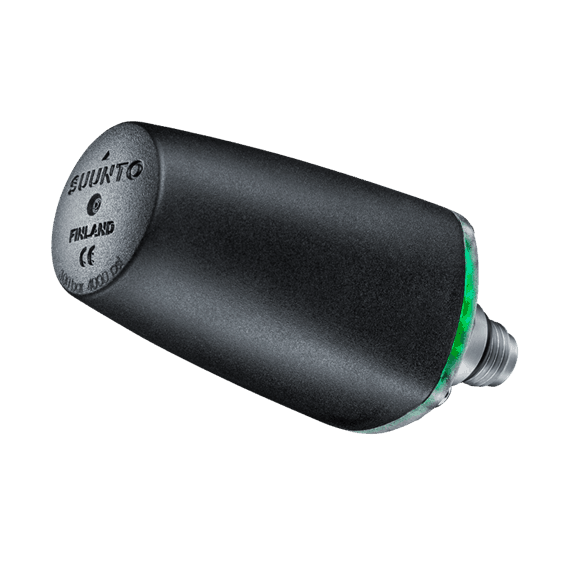 The Suunto D6i Novo has the option for adding a wireless Air Transmitter. The AI transmitter attaches to the first stage of your regulator. Suunto strongly recommends this is done by a technician as it needs to undergo a pressure test after being installed. The Suunto D6i Novo and the transmitter need to be paired before they can start talking to each other. The transmitter activates when the tank pressure is more than 15 bar (300 psi). When the D6i is placed within 1 foot (0.3 meters) of the transmitter, it receives the tank pressure data along with it's pairing code. This is a unique code to help prevent data mix-up from other divers also using a Suunto wireless AI transmitter. Pairing generally only needs to be done the one time. On the odd chance that a diver in your group is using the same code, another code needs to be assigned and the units re-paired. Tank pressure is shown in the lower left hand of the display. The remaining air time calculation begins as you start a dive. Then the first estimation of remaining air time is shown after 30-60 seconds. Remaining air calculations are based on the pressure drop in your tank which automatically adapts to the tank size and current rate of air consumption. A drop in your air consumption will slowly increase your air time, whereas an increase in air consumption will rapidly decrease the remaining air time. This avoids overly optimistic air time estimates caused by a temporary drop in air consumption. A safety reserve of 35 bar (500 psi) is included in the remaining air time calculation. When the tank pressure reaches 50 bar (700 psi), the Suunto D6i will give 2 audible double beep warnings with a blinking pressure display. This is a default setting and can't be changed. When the tank pressure reaches the second user-defined alarm pressure and when the remaining time reaches zero, two more double beeps will sound. As there is a small safety reserve built into the air time calculations, when the air time shows zero there is still a small reserve of 35 bar (500 psi). The Suunto D6i Novo makes it very easy to plan for dives with no decompression stops. If you want to dive without deco stops, use the PLAN NoDeco function. After entering the dive depth of the dive, the D6i makes the calculations needed to avoid the extra stop. All dive history from the previous 4 days, and calculated residual nitrogen are taken into account. A critical part of most diving plans is the Safety Stops. These are widely considered good diving practice. 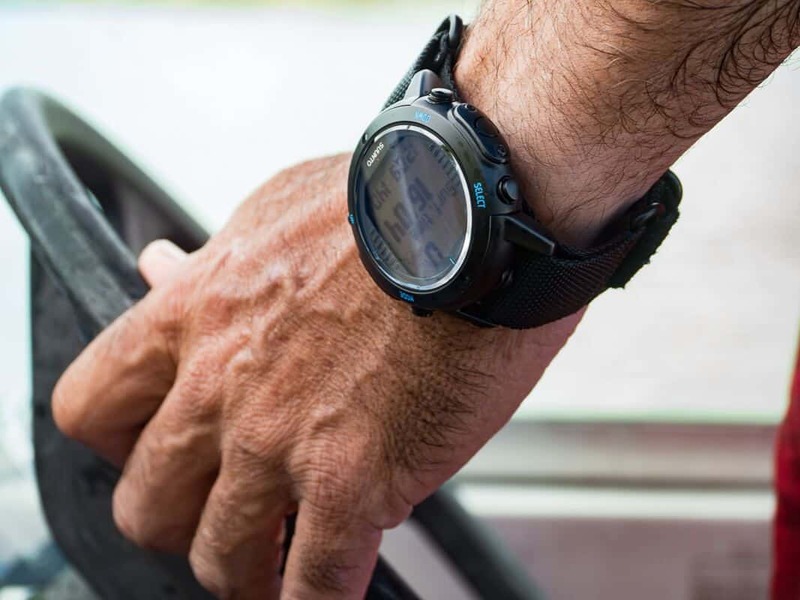 The Suunto D6i has all recommended and mandatory safety stops. Whenever you dive below 30 feet (10 meters), a 3 minute countdown for the recommended safety stop is shown. This stop is taken in the 10 ft to 20 ft (3 to 6 meter) range. Deep Stop is On by default. As long as it's not turned off, this alarm will automatically activate when diving deeper than 65.6 feet (20 meters). If the Dive timer is displayed on the dive computer when Deep Stop is activated, the timer is replaced with Deep Stop. Once the Deep Stop is over, you're able to change between Deep Stop and the Timer. Note though, if the back light function has been switched off, it won't illuminate when an alarm sounds. In MEMORY mode, you’ll find a detailed logbook and dive history. The logbook records the dive profile for each dive. The frequency of data saved in the log is based on the sample rate selected. When the battery is replaced according to the instructions (by an authorized dealer), the contents of the memory will not be lost. The capacity of the logbook depends on the dive sample rate. Without wireless AI transmitter data and at the default sample rate of 20 seconds, the capacity is approximately 140 hours. The capacity reduces to 35 hours with the air transmitter data. Once the memory is full, the oldest dives are deleted as new dives are added. The Main page shows the date and start time of the dive, the type of dive, the maximum depth, the total dive time (in minutes), and the gas percentages of the first used gas mix. This page shows the average depth, maximum depth, consumed pressure (if enabled), warnings, OLF% (if applicable), and surface time after the previous dive. The Dive Profile Graph page shows the water temperature, the depth / time profile of the dive, and the tank pressure (if enabled). The dive profile displays the point-by-point dive information such as compass heading, decompression information, ceiling and ascent time, and depth. Pressing the Select button at any time during a dive will add a Bookmark to the dive log. These are viewed in the logbook when scrolling the dive profile. Present depth, water temperature, time, tank pressure (if available), and heading (if the compass is enabled) will be recorded. How many hours does the Dive History hold? There’s two separate areas for Scuba History and Free Diving History. Scuba History records the Maximum Depth, the dive hours, and the total number of dives. A maximum of 999 dives and 999 diving hours is recorded in Scuba History. After this time, the counters reset to zero. Free dive history records the total number of dives, the deepest and longest dives of all free dives, and the cumulative dive time in hours and minutes. A maximum number of 999 dives and 99.59 diving hours are recorded. The counters reset to zero after this. The popular Zulu strap is NATO compliant. Zulu straps were originally designed for military use and built to last in tough conditions. The addition of a Zulu band makes this comfortable and stylish for every day use. Zulu bands are a favorite of divers all over the world due to the double-sling closing system. It has adapters and thick, rounded stainless steel rings, to easily adjust it when wearing over a wetsuit. This ensures it stays on your wrist even if something unexpected happens during a dive. Dive computers are designed to withstand the rigors of diving, but need to be treated with the proper care as any other precision instrument. It should go without saying, but don't go out of your way to knock it or drop it. Protect it from extreme heat and chemicals. The Suunto D6i Novo comes with a 2 year manufacturers warranty. A 1 year warranty applies to accessories such as the wireless sensors and transmitter, cables, and straps. The warranty doesn't cover the normal wear and tear including scratches, or exposure to chemicals such as sunscreens and mosquito repellents. Full warranty information can be found on Suunto's website. After each dive in salt water, rinse the wrist computer in fresh water with a mild soap. Clean the housing with a soft cloth or chamois. The water contact sensors and depth sensors are located on the side of the computer. These can be cleaned using fresh water and a soft brush or soft toothbrush. If you detect any moisture inside the case or battery compartment, take it to an Suunto authorized service agent for checking. The Suunto D6i Novo is a compact, well equipped watch-sized dive computer. This has made many lists of best dive computers for 2017. With its ability to switch between up to 3 gases, integrated 3D compass and optional wireless air transmitter, the Suunto D6i is for serious recreational, technical and professional divers. The FREE dive mode makes it a great choice for competitive free divers. This dive computer comes complete with the USB cable. The wireless air transmitter is not included in the price. This is around $450 and can always be added on later. Look for bundle deals that include transmitter that will save you money. This is classic Suunto design, functionality and reliability all in a compact, great looking package. The D6i Novo dive computer is very robust watch sized dive computer, and looks great for everyday use. Click the button below to see the current price and any discounts available for the Suunto D6i Novo and D6i Novo Zulu at your local Amazon store. Early in 2017, Suunto discontinued the D6i range of dive computers. There are some D6i models still selling on Amazon. Click the button below to see the current price and any discounts available on the Suunto D6i at your local Amazon store. It’s amazing that something so small can have all these capabilities … technology is amazing! When you do change the battery, is it expensive due to the waterproofing? Or is it the regular cost? They look quite sophisticated too! Thank you! I agree with you, I think they’re amazing too! The manufacturer recommends you have the battery changed by an authorized dealer, but there are kits available for you to do it yourself if you have the confidence. You need to remember that these are precision instruments, and personally, I wouldn’t want to take the risk of voiding the warranty. I’d suggest you get the battery changed at the same time as you have the computer serviced, as this really won’t add much to the price overall. BTW, it’s a good idea to plan on a service about every 2 years. I think the little bit extra you may have to pay to have the battery changed at the same time would be worth the peace of mind. Thanks for the detailed review. What exactly is the Deepstop function? Does it give you adequate decompression stop information once you go into decompression mode? Or does it lock you out? How conservative is this computer compared to its competitors? Great questions! I have an article that helps explain the Deep Stop function with the Suunto D4i and D6i, as well as some of the history of the Deep Stop function. The link is here. The Suunto D6i will display an error message if you miss a decompression stop. If this happens, you need to descend back to below the ceiling level and continue with the planned deco stop. This is a safety feature in order to reduce your risk of DCI. If you fail to descend within 3 minutes, then you will be locked you out of decompression information for 48 hours. The Suunto RGBM model is considered conservative by some. The level of conservatism can be adjusted to suit your personal preference. 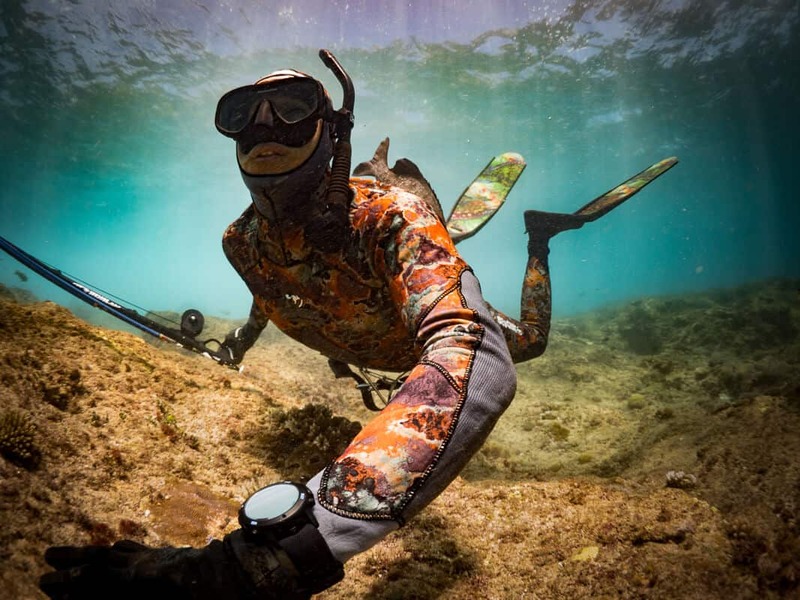 Just as an aside, Oceanic were considered to have a less conservative RGBM model than Suunto, but they’re now introducing a dual algorithm model into their dive computers that’s bringing them closer to the Suunto in conservatism. Maybe I missed it in the article, but is this dive computer compatible with mobile devices? And if so does it work with Android? Hi David, yes it is. Start by installing the free download of Suunto DM5. This lets you transfer dive logs from the dive computer and upload dive plans. Once the dive data is on your PC or Mac, you can go to http://www.movescount.com and share everything with your friends, or access online from anywhere. The Movescount App works for both an Android or iPhone and can be downloaded through Google Play or the Apple App Store. This watch is simply amazing with all of the things it can do. One of the best features, IMO, is that the memory is not lost when you change the battery. Real nice! This is a great review. Appreciate the extra detail. I’m moving to tech diving but prefer a watch-size DC. I like Suunto’s and the D6i is good. I’ve been renting these and I like them, so I’ll be buying one so I can personalize it to suit me. This would have to my favorite dive computer. What a good looking dive watch – I like the steel with stainless steel band – I think it’s a great option for your dive watch! Great review! thanks! I like this dive watch! And I thinks this a great review, too! Thank you, Sharon!